I’ve never been shy about being an advocate for eloping. The advantages of eloping over a traditional wedding ceremony are significant and the drawbacks are few. I love that over the past few years, the conception of eloping has shifted completely. I saw the value of eloping over a big ceremony early on in my career as a destination wedding photographer, which is why I opted to elope myself. Although I later went on to have a traditional ceremony, I can definitely say it was worth it to elope. I’m not entirely positive why the trend seems to have increased over the years but I would guess it’s largely due to Instagram. My grandparents had to flee their country to elope and now couples do it as a way to get amazing photos in incredible places. As both a destination wedding photographer and someone who personally eloped, I have a particular insight into eloping and have discovered three main advantages. 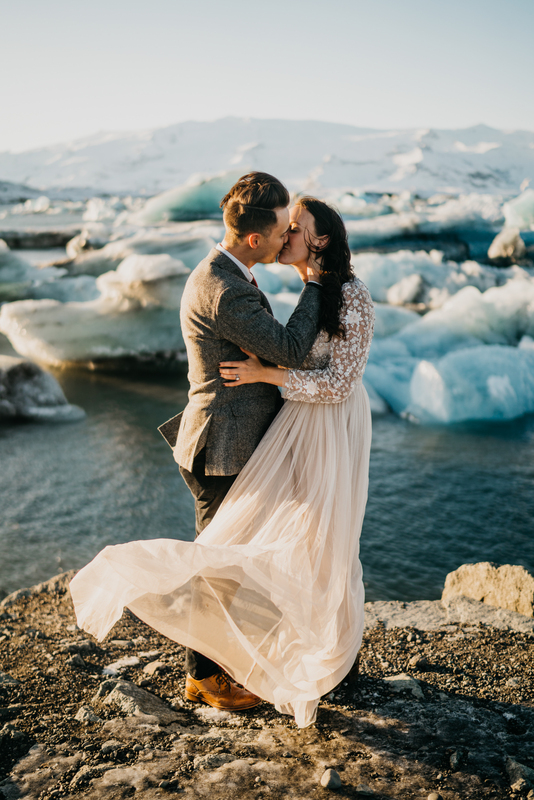 Whether you’re already narrowing down locations or are still on the fence about eloping, make sure to consider these factors! One of the intangible advantages of eloping over a traditional ceremony is the level of intimacy eloping provides compared to getting married in front of a crowd. Don’t get me wrong, saying my vows in front of my family and closest friends was overwhelmingly special and I couldn’t be happier I got to do it but being alone on a beach was far more intimate. It meant so much to have my bridesmaids by my side at my wedding ceremony but doing it alone surrounded by the natural beauty of Big Sur was meaningful in a different and more unique way. Either way, your wedding day is going to be one of the more special days of your life. Either way, you’re going to feel an emotional depth which is only felt a handful of times in life. The real question comes down to personality – whether you feel more connected to the idea of being alone with the person you’re committing your life to in nature or are more drawn to celebrating that moment immediately with the most important people in your life. On the practical side, eloping is an enormous money saver. Even for those opting for a premium elopement photographer & videographer, it’s unlikely for any elopement to end up costing more than $7-$10K. Including travel, my dress, and the photographer, our elopement didn’t even reach $4K. Compare that to the average cost of weddings in the United States, which most sources put at between $27-$35K, depending on the city. I’ve seen averages for places like New York City range as high as $70,000, something that’s hard for the majority of couples to even wrap their head around. It’s also practical to bundle your elopement and honeymoon to the same or similar location, killing two birds with one stone. A couple eloping in Barcelona could very easily honeymoon in the south of France or Italy, which would end up costing a fraction of what it would if traveling from the United States. I also recommend selling your dress at Still White, a great way to recuperate some costs in the end. For traditional wedding ceremonies, it’s almost inevitable to end up compromising on your vision because of the budget but for those who don’t want to compromise on a single thing, eloping is the best solution. There are some locations that just aren’t conducive for a traditional wedding. I don’t know how many guests you’d get to show up to a wedding in a Patagonia or even how that’d be logistically possible but for eloping, it’s a different story altogether. Whether it’s the Swiss Alps, Big Sur, or a beach in Maui, there are limits on where a traditional wedding can be held that don’t exist for an elopement ceremony. Don’t get me wrong, places like Santorini still offer incredibly beautiful, breathtaking views that are more than suited for a traditional wedding. The only difference is that your options are essentially limitless when it comes to elopement locations. Although the story of eloping in the Moroccan desert is unforgettable, this advantage is really magnified when it comes to photos. As a destination wedding photographer, I can’t help but give eloping the edge for photos because some of the most photogenic locations in the entire world can become the backdrop for bridal portraits. What else could a wedding photographer possibly ask for? One important factor to keep in mind is that eloping is not the norm. Most would call it unusual and, depending on your friends and family, you might get a lot of flack for even bringing up the idea. This may sound like a very millennial thing to say, but the day of your marriage is ultimately about you. The pressure around you may be to follow the norm and start your marriage by making a huge dent in your savings and go through your engagement stressed out from wedding planning, but it doesn’t have to be that way. I love weddings, even big traditional ones, which is why I became a destination wedding photographer in the first place, but that doesn’t mean I’m not a supporter of alternatives. In all my years of wedding photography, I’ve never known one couple who regretting eloping. For any couple even remotely considering it, I highly encourage you to go for it. For those who can’t help but be on the fence, reach out to me. I’d love to be a resource for anyone going back and forth on whether they should elope so make sure to fill out a form submission or reach out at 786-683-9168 and we can get a dialogue going!